WHEELING — Storyteller Alan Irvine shared river tales, mostly true in nature, with an audience Tuesday at the Ohio County Public Library. The French had a closer presence and alliances with almost all of the Native American tribes, so the English forces’ only hope was to try a bluff to slow the French troops. As part of that effort, George Washington, then a 22-year-old Virginia militia member, and Christopher Gist, who owned a trading post, set off to deliver a letter from Virginia Lt. Gov. Robert Dinwiddie to a French commander at a fort on Presque Isle, near Erie. Returning in mid-December, the pair made a raft that was shattered by a 10-foot rock in the middle of the Allegheny River. Irvine said Washington rescued Gist, who could not swim, and they reached an island in enemy territory. “Falling temperatures saved their lives,” the storyteller related. The next morning, Washington and Gist discovered that the back channel of the Allegheny had frozen. They crept across the ice to the shore, then headed back to Gist’s trading post. Later, the island near Pittsburgh was named Washington’s Landing in recognition of the future president’s first trip into the Ohio territory, he said. For his second story, Irvine related the plight of explorer Meriwether Lewis being stuck in Pittsburgh for months while waiting for a river boat to be built for the Lewis and Clark Expedition. After Emperor Napoleon Bonaparte of France sold the Louisiana territory to the United States, Lewis and William Clark were recruited to lead a major exploration across country to the Pacific Ocean. Irvine said Lewis arranged to meet Clark at the juncture of the Ohio and Mississippi rivers; Lewis found a Pittsburgh builder to craft a river boat. However, when Lewis arrived in Pittsburgh in June 1803, he learned that the builder was a drunk and had not constructed the boat, Irvine said. Undeterred, Lewis hired a crew and moved two tons of supplies into the boat yard. Finally, on Aug. 30, 1803, the boat was completed and launched, but “it ran aground almost immediately on the Ohio,” the speaker said. Despite the inauspicious beginning, the two-year expedition was completed successfully. 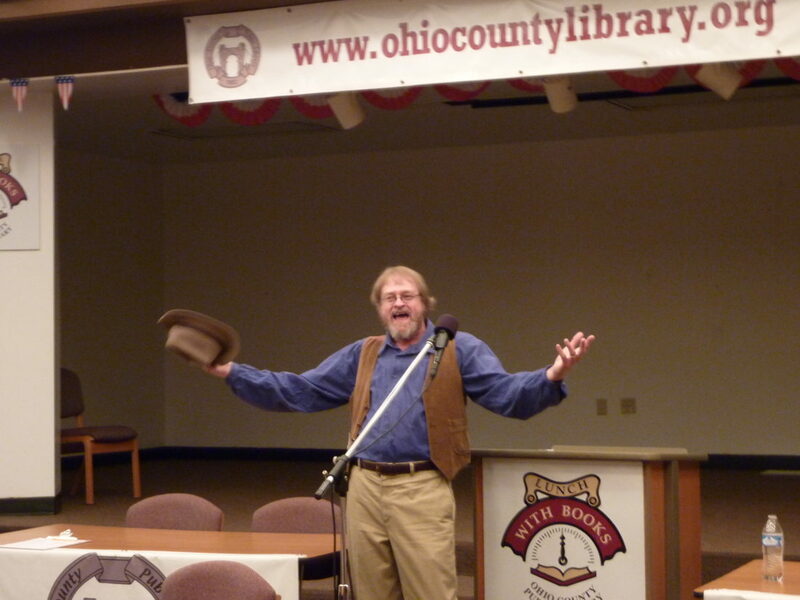 For the final story of his lively presentation, Irvine performed rollicking tales of fact or fiction about boatman Mike Fink, who was born on the banks of the Ohio River in 1794. “The river was in his blood,” the storyteller said. Fink, who crewed on flatboats and keelboats, spent much time boasting, bragging and engaging in exploits. He was one of the strongest men on the river and “the best shot in the entire Ohio (territory),” Irvine said. According to legend, Fink supposedly beat Davy Crockett in a shooting contest and he outwitted a Native American known as “Injun Joe.” On a dare, Fink shot a growth off a man’s foot, then avoided criminal charges by claiming his action enabled the man to wear a boot again. Another time, Fink tricked a farmer into thinking that his sheep’s eyes were infected, then shot and killed the sheep, which his crew retrieved and roasted. “Mike was not above helping himself,” Irvine quipped.